This year my daughter decided on a Hollywood Theme. 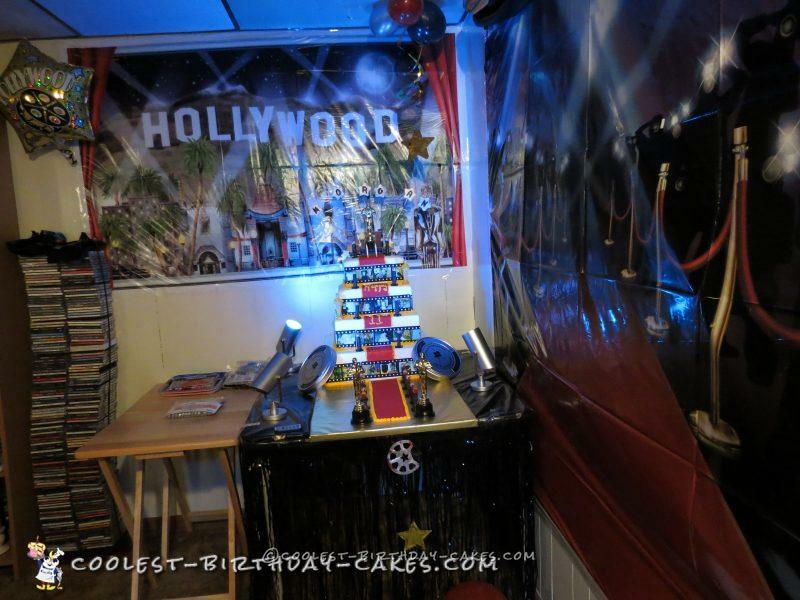 I decided it had to have Oscars, Lights, Film, all of it! (And I would say I succeeded). 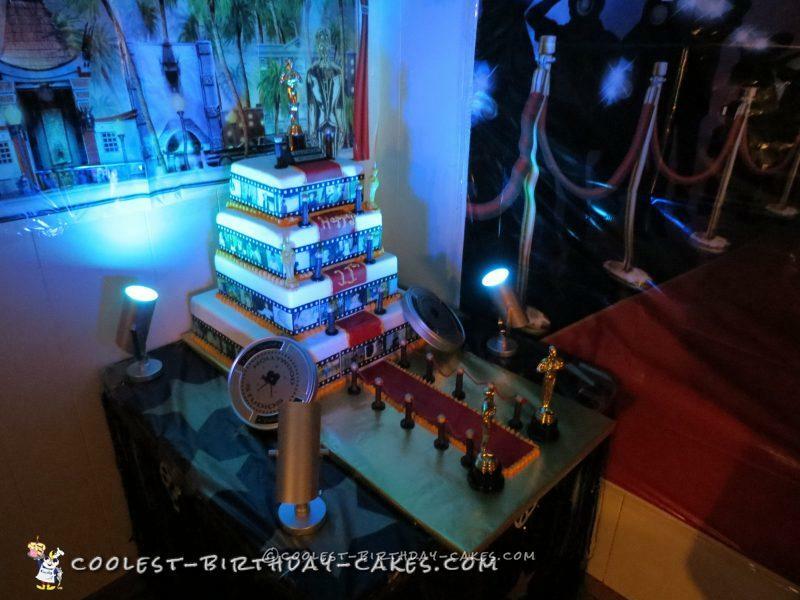 For this cake, I used an 18″x32″ board because let me tell you, this cake weighs a TON and I needed the stability! 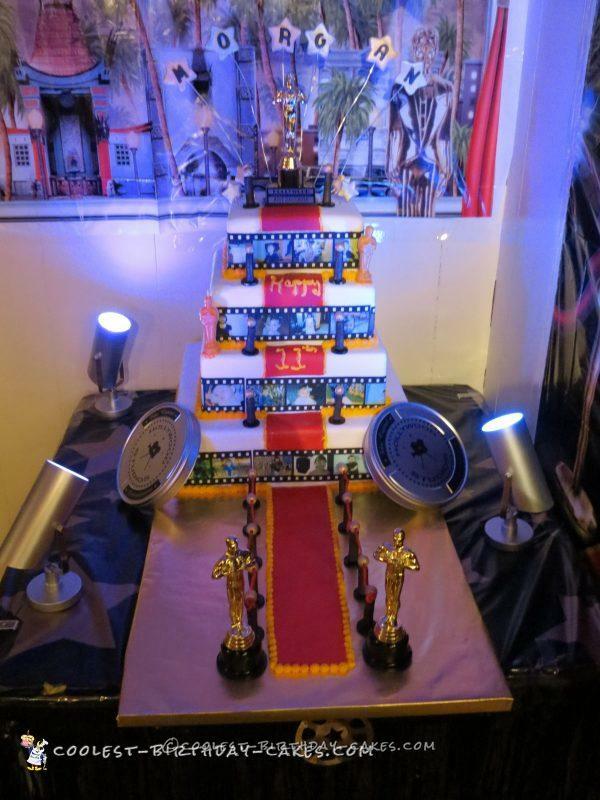 The bottom two tiers are styrofoam cake dummies covered in fondant. If you can see the film strips going around the bottom of each tier, I photoshoped each image of my Daughter in different stages of her life into the film reel and then printed them on sugar sheets with edible ink. They turned out better than I had envisioned. 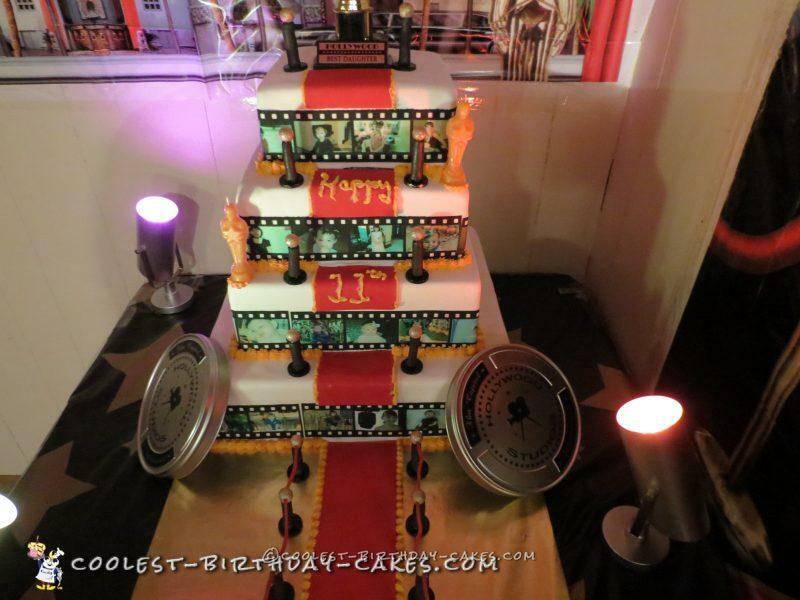 The bottom tier is 16″, the next one up is 12″, then the top two tiers (10″ & 8″) are actually real cakes covered in fondant with the sugar sheet film strips going around each layer. I ordered the lights online because we needed flood/spotlights. I loved the affect when they changed colors. The Oscar-type statues are all plastic but I think really add to the effect. I made the posts out of gum paste painted with luster-dust and pure lemon extract. Then I glued them on chocolate coins wrapped in black foil. The balls at the top of each post are wooden beads from the craft store spray-painted gold with glitter. “Velvet Rope” is simply pull-n-peel licorice threaded through the tops of the posts. 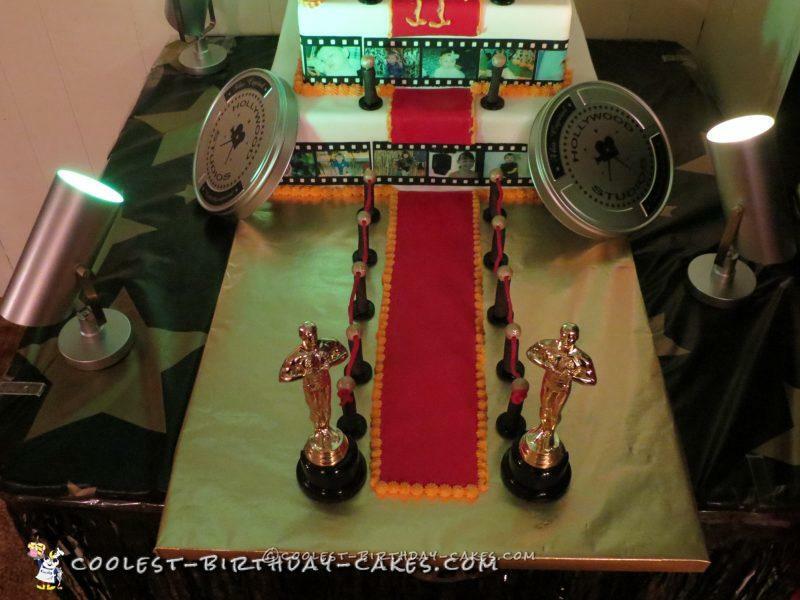 Red Carpet is fondant and yellow boarder is icing. I have been working on the “fake” elements of this cake now for over two weeks. Thursday night I baked 3 sheet cakes to use for the 10″ and 8″ layers. Friday I cut, iced, fondant, and film-stripped the top two tiers. I started assembly of this cake at 5:30 Saturday morning because that’s when the house is the quietest and no one bothers me :) I finally finished at about 8 AM so assembly took almost 3 hours to complete as I hat to roll out and measure and cut each section of “Red Carpet” for each tier because I didn’t want to cover all the work I did on the film strips. The stars at the top were made out of gum paste and painted with luster dust mixed with lemon extract. Then I punched out the letters of her name to make sure she had the full “star” treatment. This cake was a labor of love, for the one I love. Have to re-make the top two tiers for her Hollywood Party this weekend with all her friends…oh, did I mention we have two parties, one for family and adult friends and the other for her friends! Yep, we are crazy! The family was amazed once again that I was able to pull this one off. They are always excited to see what is next! You do such an amazing job! Your daughter is so lucky to have such an amazing and talented father. I love seeing your fabulous baking and decorating skills. To have them not only look wonderful but then taste fantastic is awesome. I like last years cake too.